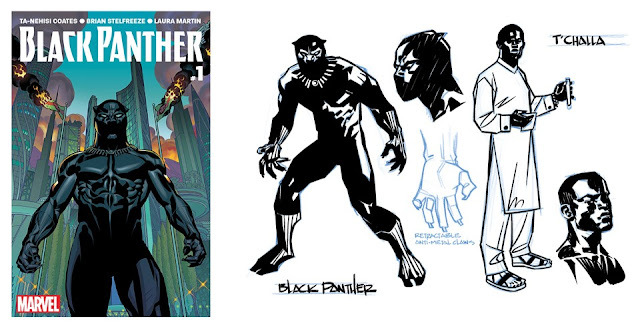 The Atlantic - "The Return of The Black Panther"
"Despite the difference in style and practice of storytelling, my approach to comic books ultimately differs little from my approach to journalism. In both forms, I am trying to answer a question. In my work for The Atlantic I have, for some time, been asking a particular question: Can a society part with, and triumph over, the very plunder that made it possible? In Black Panther there is a simpler question: Can a good man be a king, and would an advanced society tolerate a monarch? Research is crucial in both cases. The Black Panther I offer pulls from the archives of Marvel and the character’s own long history. But it also pulls from the very real history of society—from the pre-colonial era of Africa, the peasant rebellions that wracked Europe toward the end of the Middle Ages, the American Civil War, the Arab Spring, and the rise of isis."